Support active, clickable links within Help Text. This would be helpful for fields where greater detail may be needed to orient the user on how to use the field. With live URLs within Help Text, users could be pointed to detailed supporting documentation on Content or any other online resource. 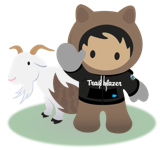 +1 - Being able to connect to myTrailhead resources would be great and enable us to really leverage that platform. I agree with the previous comments, this would be a great benefit to all of our users! Please strongly consider this feature Salesforce! This would be a great benefit to our users! I would like this functionality as well. Even cooler if this could be a customizable link that looked up and directed you to specific records. This would be extremely helpfully especially when onboarding new users. This is required to avoid redirect to a Knowledge Article from the Helptext.